Bumblebees, pumpkins, and superheros! If you are like me, you have already started thinking of Halloween costumes to dress up your pets. It can be a fun day to look silly and your pets are no exception. However, something as simple as a costume can be very dangerous for your pet. Here are some tips to help make sure your pet enjoys a fun and safe Halloween. When choosing a costume, make sure that your pet is able to move freely around. If the costume drags on the ground, they may trip over the costume or get tangled in it. This is can lead to serious injuries. Make sure that the costume is not too tight around your animal’s neck. This can be a choking hazard. Unlike children, dogs are not able to tell you if something is too tight. Watch your pet and see if they are fidgeting or uncomfortable in their costume. Another suggestion is to place two fingers between the costume and the pet’s neck. The two-finger test is a great tool to test if the costume is too tight. Is there such a thing as too many bows? Bows, bells, or other small objects dangling from costumes can be choking hazards. Animals love to investigate and play with new toys and these small objects will be too tempting. If swallowed these objects can cause serious injury to your dog or cat’s intestinal tract. It’s best to avoid any pet costume that has small objects within reach of your pet (chest, legs, or wherever else your pet has access to). Do superhero boots make the costume? There are some costumes that cover your pet’s front paws. Although it may look cute, this can be dangerous and can cause them to trip and injure themselves. 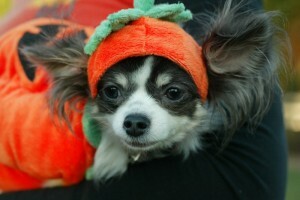 Beware of these costumes, and choose instead costumes that do not restrict your pet’s movements. Most importantly, never leave your pet unattended while they are wearing their costume. This is dangerous because the costume could get caught on something or become twisted or tangled resulting in an injury or distress to your pet. There are many Halloween costumes available that are both adorable and safe. When choosing which one is best for your pet, keep the above tips in mind. Many pets don’t enjoy dressing up, so don’t make this holiday an ordeal for your dog or cat. Consider a Halloween themed collar or kerchief for these pets instead. Your pet’s safety, health and happiness should always be the first priority. Happy Halloween!